China is considered to be one of the global leaders driving global growth and its recent meltdown has a far reaching impact on the economies of the world countries, including India. At first people believed that it was only a market bubble and other economies will not be affected by it. But Chinese stocks listed globally have also fallen showing that the impact of this phenomenon can affect other countries badly. Australia is presently feeling the depression as China is their largest trading partner consuming a great portion of their mining output. So, what does India import from China? # Well, almost all toys, a child might say. For the grown-ups, nearly all household smart phone brands, be it Apple, Micromax, Xiaomi or Lenovo, would either have been shipped from China, or will have some components made in China. # Telecom instruments, right from the handset to equipment that goes into telecom infrastructure, come from China. # Pharmaceutical companies will tell you how dependent they are on China made basic raw materials – intermediates, bulk drugs etc. – for the manufacture of medicines in India. # In value terms, China accounts for approximately one-tenth of India’s merchandise trade, and bulk of it comes from imports of goods to India. What is the Story of China? # When China opened up its economy in the late 70s, it offered large tracts of land at dirt cheap prices, abundant labour that was cheap but unskilled, while power, water, building materials and capital, was made available at hugely subsidized rates. # All of these put together made China a very attractive destination for cheap manufacturing and this had initial investors from the Japan, Taiwan, Hong Kong and of course, the US, making a beeline for China. The Chinese economy grew at a furious pace for the last three decades, helping China build huge cash reserves that is now playing a critical role in impacting global markets. # But fundamental problems remained. # China still has a regulated economy which means that the government decides on how the economy will grow, which sectors will be promoted, what will be the strength of their currency, viz a viz other currencies and how the stock markets will behave. How do Chinese Execute all these things? To keep the economy growing at close to double digits as it had been for the last three decades, the Chinese government promoted massive investments in the infrastructure sector. After signs of a slowdown in the economy started showing up, the government promoted the realty market, encouraging investors to pour in billions into residential and commercial buildings. After the realty bubble burst, the government began encouraging first time retail investors to start pouring money into the stock market, and now the with the Chinese stock market crashing, world economy is being held ransom to the Chinese bubble. # Hard commodities have been affected as a result of the Chinese slow down. Copper, Aluminum, etc. are trading at prices below cost of production of many Chinese companies. It is a welcome sign for India as a consumer since the cost of constructing infrastructure in smart cities will come down. # Low prices are not advantageous for producers of these metals as China is aggressively selling them to raise cash. As a result metal stocks are affected badly. # Oil prices were already falling due to the global slowdown and the new Chinese crash made the prices fall much lower. From the Indian point of view, low oil prices will help to manage our deficit and bring the inflation under control. # Automobile exporters find the present Chinese melt down as bane (unhappy) as China was their fastest growing market. The manufacturing hub of china has rooted to India due to the investment friendly climate in this country. 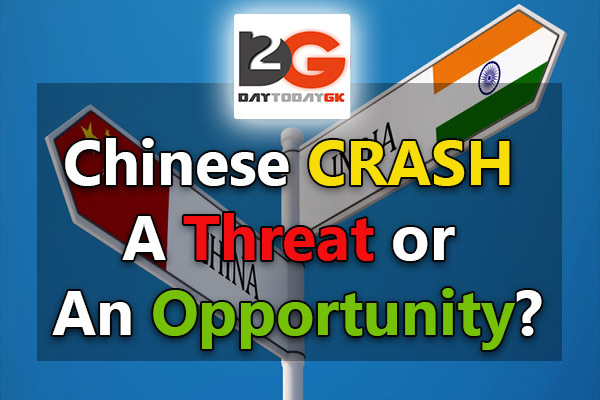 Chinese Crash A Threat or An Opportunity? # If Chinese officials will further devalue their currency accelerating growth, the global market will be full of Chinese goods at the lowest prices, thereby affecting the economy of other countries including India. # There are actually two perspectives here. One that says that the crash is an opportunity, the other, that it is a threat. The fact lies somewhere in between, with answers lying mostly with the Indian government and how they respond to the emerging situation. # The India story is more stable and built on a more solid foundation than China. Indian democracy has evolved over time making India politically stable, at least relatively. The country has a fair and established judiciary and labour laws are more or less in place to continue to offer a stable manufacturing and services base. # The Indian economy does not depend too much on Chinese products, as many other emerging economies, and therefore, India is relatively insulated. But it will have a negative impact on the Indian economy to some extent but the country is well placed to absorb that. The sinking Chinese economy up-lift India in many aspects. As a pear companion of global competitor, India behold significant competitive advantage from china on this juncture. Threat or opportunity, depends on how the government handles the much delayed reforms process. On the Request of our readers we’ve decoded the “Chinese Slowdown and its impact” in D2G’s way. Tell us what you feel about this? and if you think we can make another article suggest the Topic on comment Section. Don’t forget to Read other DECODED Articles.